Diptych, digital prints, 90 x 2,50 cm. Photography by JW Kaldenbach, Styling Lonneke Démoed, hair and make-up Maison Manous, nails & assistance Niko Démoed. 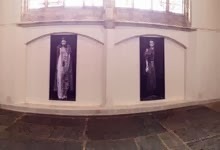 On exhibit at The Oude Kerk, Amsterdam.